Throughout Lent I have been trying to explain to the littles what Easter is. If you ask them you may get a few different answers. Easter is wearing a tie, eggs, church or He’s alive, Alleluia! I know I stumble through my teaching ability and am not the most creative in hands on projects, but I am excited to see how this new Easter tradition plays out. This idea is not exactly an original, we found it a few years ago and put it in the “For When We Have Kids” folder. We made a few modifications and will give it a try this Easter, as we help our sons understand what the celebration of Easter is really about. 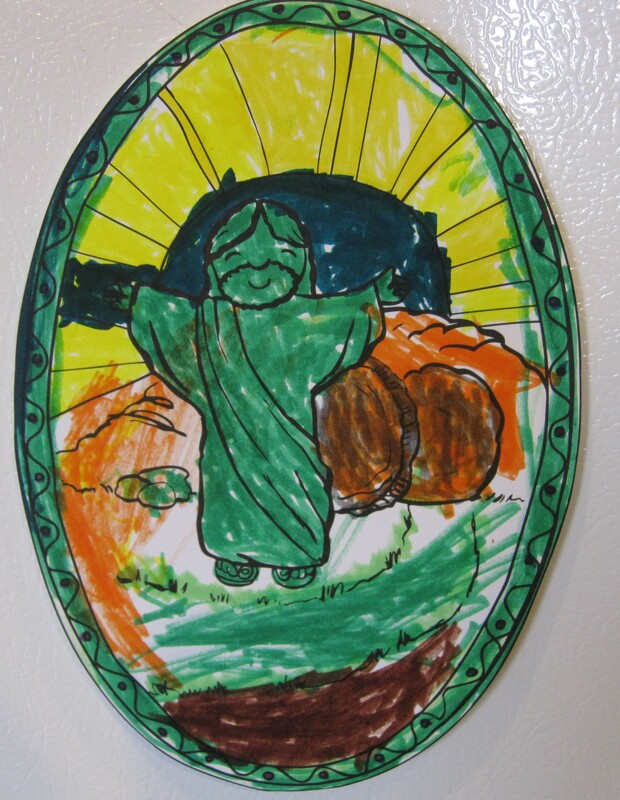 Earlier this week the boys colored a picture of the Risen Lord in preparation for Easter. On Good Friday the boys will make a picture of Jesus on the cross. They will then put their pictures in a tomb (decorated shoe box). Easter morning they will find the boxes open and empty. The boys will then need to go in search of the Risen Jesus. When they find Jesus they will also see another surprise, their Easter basket!! May your preparation for Easter be grace filled and blessed! Very cute idea! We are doing holy heroes this year, and will probably do it every year now cause I loved it! They’re at http://www.holyheroes.com. They have daily activities for many ages. My daughter keeps asking if its Easter yet, so having a sort of calendar to count down is really helpful for a visual. Don’t forget to greet in Mfantse for Easter! Greeting is “Christ wa sur” which means Christ is risen. The response one is supposed to say is “Wa sur mpa” which means, he is risen indeed! I imagine that will at least sound familiar to the boys! God bless you all this Easter! Let us feast to celebrate our God! WA SUR MPA!!!! And they loved it!! It was so neat to see them re-tell the Easter story and excited to find Jesus! !